US, 2006, 90 minutes, Colour. Justin Long, Jonah Hill, Adam Herschman, Blake Lively, Columbus Short, Maria Thayer, Lewis Black. A pleasantly anarchic little comedy. There seems to be an American high school comedy every month. Many of them are of the leering variety. Many of them are simply inane. Not that this one doesn’t have a moment or two of leering – and it is not the most intelligent comedy to reach the screen. However, the films that really are its forebears are not so much the campus comedies but films like Dead Poets Society, The Emperor’s Club or Mona Lisa Smile. It is actually about education and what it ought to be – in a more creative than formal and traditional sense. That probably makes it sound more profound than it really is. But, it does make a comic case for more spontaneity, creativity, relevance and student participation in studies. Justin Long (Jeepers Creepers, Dodgeball, The Break Up) fails to get into any college. Pressured by his parents, he concocts a harebrained scheme with some student friends to fabricate a technological college with its own website which deceives parents. However, the site also has an admittance and acceptance icon – which attracts about three hundred students who were also not accepted elsewhere. What to do? With the help of an ex-professor rebel and ingenuity and luck, they succeed. Yes, it is more than a touch adolescent but you would have to be a bit of a stick in the mud to disagree with the basic thrust of the film. 1. Teenage comedy? In the high school tradition - but not so gross-out? In the tradition of Dead Poets Society, The Emperors Club, Mona Lisa Smile and films about the nature of education? 2. The city settings, the homes, the schools, the universities and colleges? The realistic atmosphere? For this kind of comedy? Musical score? Songs? 3. The title, the importance of acceptance to college for students, for parents, for future careers? The irony of Bartleby and the others not being accepted? The parallels with the students who were accepted - and traditional colleges, initiations and other aspects? The setting up of the alternate education system - and its being accepted? 4. The humour, the fantasy aspects of the plot, Bartleby and the others building up an alternate education system? The board and its acceptance of the experiment? The portrait of teenagers, parents, hopes and ambitions? 5. The tradition of the high school comedy – the nerdy characters, the glamorous characters, the authorities and teachers? The parents? The leering jokes, the gross-out jokes - but this being a PG13 film and its being moderate? 6. Bartleby, the opening, doing the fake cards and the photography? His quick thinking and getting the students as a glee club and his power of persuasion over the teacher? At home, his precocious sister? The various letters and his not being accepted? Trying to tell the parents at the table? His decision to forge the letter for acceptance, to invent the institution, getting Sherman to set up the website? His parents' joy, giving him the cheque? 7. Bartleby and Sherman, their friendship? Sherman and his size, his wealth? His being accepted? The parties at his home - the discussions between the parents, especially about acceptance? Sherman and his being a whiz? 8. 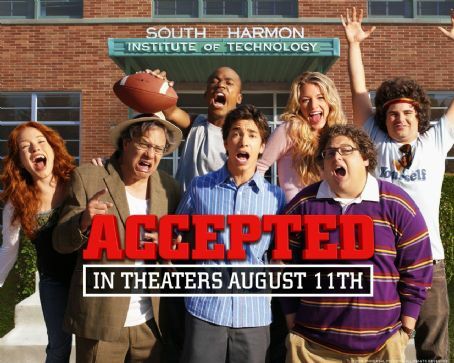 Glenn, Rory and the others who were not accepted? The decision to find a place? Bartleby and his finding the empty institution? Getting the lease, taking it over? The hard work in cleaning the place up, making it presentable? The title at the front? 9. The arrival of all the other students, on line, being accepted? Bartleby and his trying to work something out, the desperation of the others? Sherman and his trying to help? The decision to keep going, the money coming in, the renovations, the pool? The board with everybody writing what they wanted to do? The various students arriving - the man who wanted to move things by his mind, the ex-GI rock 'n roller, the girls and fashion and beauty.? 10. The contrast with the college, Monica and her boyfriend, life at the college, Bartleby going to the party, taking the blazer, insinuating himself, finding Sherman? Relying on Sherman for help? Sherman and his wanting to be accepted, being humiliated by the other members of the fraternity, his dressing up, being mocked? The hazing and initiation? 11. The success of Bartleby's institution, getting Uncle Ben, Uncle Ben's background, his unorthodox views on the economy, the students all listening? The skateboarding, Rory and the meditation, the ADD boy and his settling down.? 12. The party, the fraternity's lack of success? Their coming to the party, Monica and her meeting with Bartleby, their memories, his giving her the camera, her coming to the alternate institution? 13. Family Day, the plan to ruin the institution? The reaction of the parents? The visit of the principal of the college, his animosity? 14. Sherman, his seeming to reject Bartleby, Monica and her going away? Sherman and his idea for the application for recognition? 15. The hearing, Bartleby's speech, Uncle Ben's speech? The members of the board, their listening? The college representatives and their spurning Bartleby? The students in support - and the speeches about skateboarding enabling people to understand engineering and physics, the wild cook friend and his cuisine.? 16. Bartleby's appeal, the head of the board and his having wanted to play trombone, the discussion, allowing the recognition for a year? 17. The happy ending, acceptance - and the theme about people recognising their needs, creating their courses, ways of learning, the contrast with the formalities of traditional education and its straitjacketing people? A worthy cause in a pleasantly anarchic film?